Do You Know the Symptoms of Migraine Prodrome? Home/Migraines / Headaches/Do You Know the Symptoms of Migraine Prodrome? 39 million people in the US get migraines, and yet there are still many people who do not know the four migraine phases. In fact, not all migraineurs get all four phases, so even if you struggle with migraines, some of this information may be new to you. First, let’s consider the four migraine phases. We will focus specifically on the symptoms for migraine prodrome. Then we will take a closer look at a natural way to find relief. Let’s begin by discussing the four phases of a migraine. At first, we will only briefly mention the prodrome phase because will get in-depth with that part in a moment. 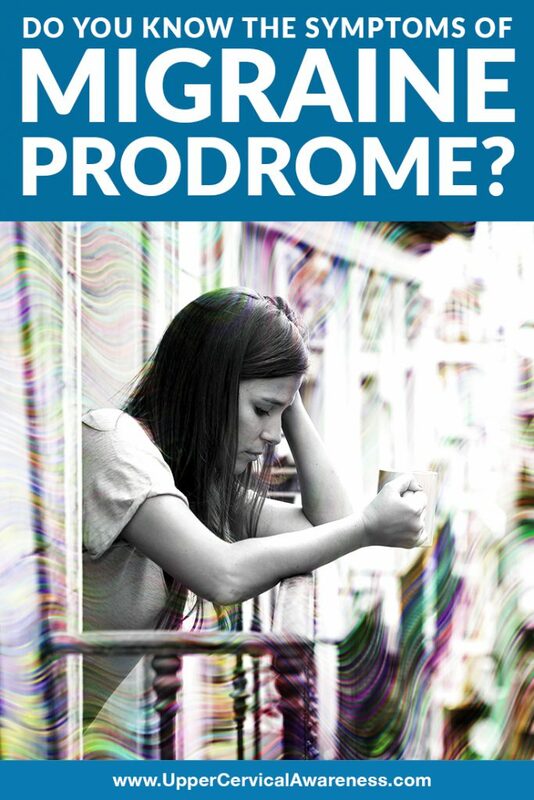 Prodrome – This is the wind-up phase of the migraine. It can start a few hours or even a full day before the actual headache phase begins. Aura – This phase generally occurs within an hour of the start of the headache phase. Symptoms can include numbness and tingling in the hands, face, and other locations in the body. There are often visual disturbances such as seeing flashing lights or bright, zig-zag lines. Temporary loss of vision can also occur during the aura phase. About 20-25% of migraineurs experience this phase. Headache – This is the actual migraine attack. Since a moderate to severe headache occurs 85-90% of the time during an attack, it is usually called the headache phase. Migraine headaches are also known for involving a throbbing or pulsing sensation, and they are often made worse by exertion. In about two-thirds of cases, pain is one-sided. There are many other symptoms during this phase that can include sensory sensitivities, neck pain, nausea and vomiting, sinus troubles, and anxiety and depression (to name a few). Postdrome – This is sometimes called a migraine hangover, but it can be so much worse than a hangover from having too much to drink. First of all, symptoms can last for up to 48 hours. A person can be either euphoric or depressed during this period. Fatigue is also very common. Finally, the cognitive symptoms include difficulty concentrating or understanding things that are happening. Now let’s focus on the prodrome phase, which has some of the oddest symptoms of a migraine. About 3 in 10 people who get migraines will experience the prodrome phase according to Migraine Buddy. If you fall into that category, you may experience some or all of these symptoms in the hours before your migraine begins. Insomnia – The night before a migraine, it may be very difficult to sleep. Of course, lack of sleep can also be a migraine trigger, so this is one of those symptoms that may sometimes be part of the prodrome, but it may also occur when there is no prodrome. Food cravings – This is another complicated prodrome symptom. Some people are convinced that certain foods trigger their migraines. However, it is possible that they only eat those foods because of cravings they get from the prodrome. So the craving was already a sign that the migraine was on the way, rather than the food being the trigger. Sensory sensitivities – This is one of the most common migraine symptoms, but it can also occur up to 24 hours before the migraine begins. Of course, if a person is experiencing a silent migraine (migraine without a headache), this may be part of the actual attack. Again, this is another prodrome symptom that can also be a trigger. Yawning – Researchers still don’t completely understand why we yawn to begin with. It is believed to be connected to the body trying to get more oxygen. If this is the case, perhaps we yawn in the hours before a migraine because the headache itself is related to reduced blood flow to the brain. Cognitive symptoms – There can be a wide range of cognitive symptoms that precede a migraine. Some of these include concentration issues, problems with reading and speaking, mood swings, and more. In addition to these symptoms, people also may experience frequent urination, fatigue, and neck pain. In fact, between the number of patients who experience neck pain during the prodrome phase and those who experience this symptom during the actual headache phase, it is one of the most common migraine symptoms. If you experience migraines, whether you just get the bad headaches or you have to deal with all four debilitating phases, there is hope. Upper cervical chiropractic has helped many patients to break free from migraines, sometimes even after just one or two adjustments. Consider some of the symptoms we have discussed. Neck pain is extremely common with migraines, so it makes sense that the underlying issue is located here. Lack of oxygen can play a role, and an upper cervical misalignment can affect blood flow to the brain. There are many other cognitive symptoms as well as issues with sleep. If the atlas (C1) is misaligned and putting pressure on the brainstem, all of these symptoms can occur. So it makes sense to get the atlas checked if you suffer from migraines. In the worst case, you find out you are in proper alignment, and then at least you know this isn’t the problem. In the best case, you may be able to say goodbye to migraines for good. So schedule a consultation today to learn if this is the natural solution you have been searching for. Dr. Hall2019-02-02T17:31:54+00:00December 9th, 2018|Migraines / Headaches|Comments Off on Do You Know the Symptoms of Migraine Prodrome?